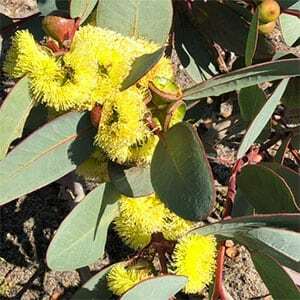 A small growing tree with attractive yellow flowers, Eucalyptus preissiana is commonly called the Bell-fruited Mallee. From the southern areas of Western Australia around Esperance, this is an adaptable tree and will grow well in a range of climates. With a natural shrubby habit it does grow from a lignotuber and can easily be pruned. The term ‘Mallee’ means multi trunked and these will form over time. A well drained soil is essential and in its natural habitat it grows in coastal areas with sandy soils. For good flowering, moisture over autumn and winter is essential. In particularly dry winters flowering is often limited. This is not a species that takes well to humidity and it is not suited to tropical conditions. Having a lignotuber means you can prune Eucalyptus preissiana right back to the ground. This will encourage multi trunks and good new growth. Usually from seed which will take a few years to obtain a plant that will flower. Flowering time – From Spring to summer.